***It should be noted that “general-purpose” lifts —those not designed specifically for data center use—are not able to handle all three functions as described. Additionally, some lifts marketed as “purpose-built” do not effectively solve all 3 problems, exposing their users to unnecessary risks. To counteract any false information provided elsewhere, a research team compared how ServerLIFT and Racklift data center lifts perform in a series of tests. That study was conducted by the Product and Competitive Testing team at Arizona State University (with input from Industrial Design and Engineering teams). A data center lift must move efficiently for server installation. From starting point to the target, the Racklift is slower and more cumbersome. A ServerLIFT device moves through corridors 25% faster. A properly designed data center lift must maneuver down narrow aisles and turn smoothly around corners. 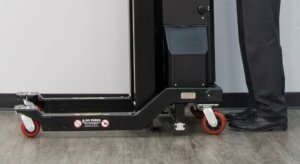 The Racklift RL600 series requires a wider aisle (48 – 60” [121 – 152 cm]) for maneuvering and cannot turn smoothly around corners. The ServerLIFT unit maneuvers comfortably in a narrower 36” (91 cm) aisle and can turn corners smoothly. 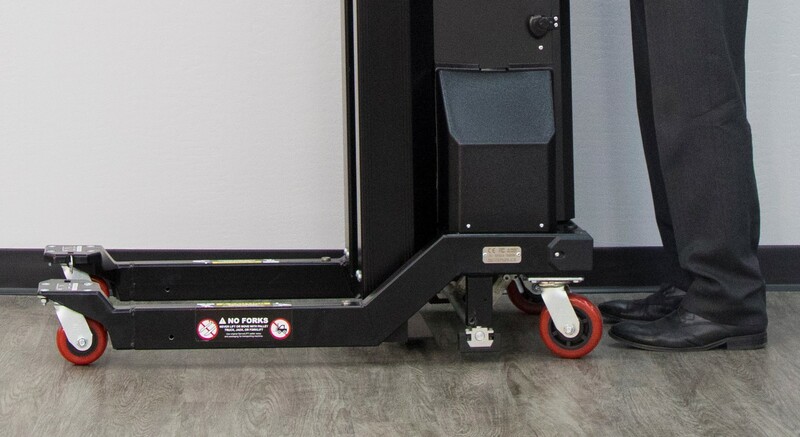 The ServerLIFT “Easy Glide” platform allows side-to-side installation, which gives the operator access to the rack on either side of the aisle. A ServerLIFT device never needs to be turned around for the operator to switch and work on the other side of the aisle. Data center lifts should be able to move equipment from one room to another through standard door frames and elevator entryways. Racklift units measure 82.75” (201 cm) tall, so they cannot fit through standard doors and elevator entryways that tend to measure anywhere from 78 to 82 inches (198-208 cm) high. To compensate, you’d need to tip the lift to move it through, risking serious injury. 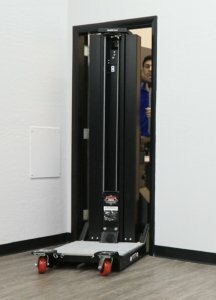 ServerLIFT units measure 69.5 inches (176.5 cm) high with its tower fully retracted (the SL-1000X model is 78 inches or 198 cm), so it’s able to pass through both standard door frames and elevator entrances with room to spare. 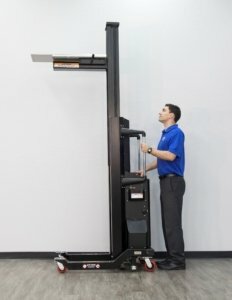 A data center lift must be able to navigate over obstructions without damaging equipment or risking injury to the operator. The Racklift has a clearance of only half an inch (1.25 cm.) This low clearance prevents it from safely passing over power cord channels, ramps, and door thresholds, even when it is not loaded. This makes it likely to tip over, putting the onboard server, the operator, and surrounding equipment in serious danger. The ServerLIFT device, with nearly a full inch (2.5 cm) of ground clearance, safely passes over all types of obstructions, when loaded or unloaded, without tipping. The ideal data center lift should help to install servers and other equipment into any rack and every rack unit. The RackLift device only reaches to the top of standard 42U racks. On the other hand, with its extendable tower and modular platform accessories, the ServerLIFT data center lift can safely support devices up to the top of a 62U rack (112 inches, or 284.5 cm). Server handling lifts must also maintain a level platform. Post-to-post alignment and angled installations for slotted and drop-in rails is also required. Racklift’s extending shelf positions equipment in the rack but cannot adjust the angle of the server. The operator must do so manually, both for side-to-side alignment and for drop-in rails. This is made even more difficult by the Racklift frame, which places a tech at high risk for pinched fingers or pulled muscles. 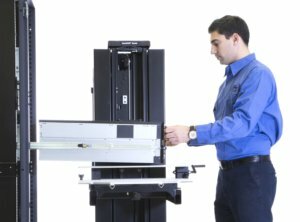 Only ServerLIFT devices offer control over the alignment of servers. 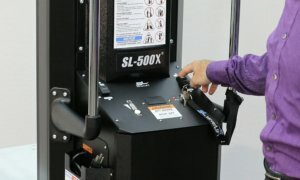 Any ServerLIFT device can angle equipment into slotted and drop-in rails using the RS-500X Rail Lift. The 3rd essential function of a data center lift is to assist with installing and removing servers in a safe and efficient manner. 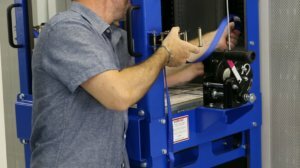 Both the ServerLIFT and RackLift provide physical support for devices into and out of server cabinets. However, the Racklift falls short in a number of associated categories, including operator access, stability, and support. There should be clear access to the server during installation into the rack. On the Racklift, this is not the case. The server is placed inside a four-post frame. 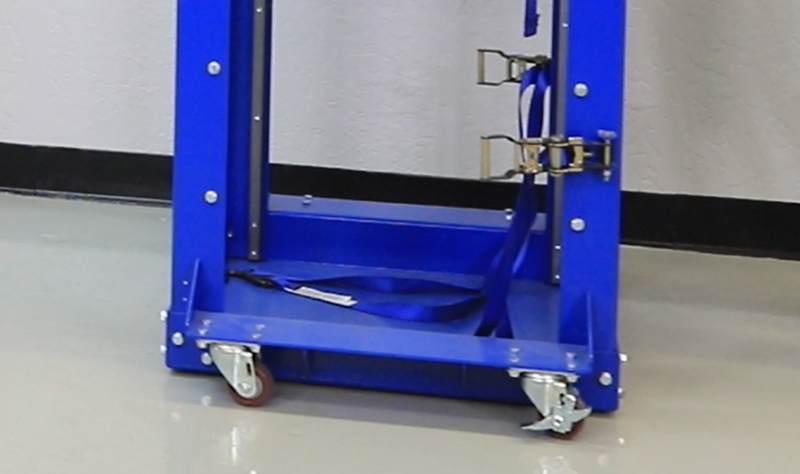 This frame, along with stabilizing straps and the winch, obstructs or completely blocks visibility and access, forcing the operator to reach inside the frame to perform a dangerous server installation or removal. ServerLIFT devices provide completely clear and safe access to the server during the installation process. Rather than housing the server in a semi-enclosed frame, the ServerLIFT platform supports the server forward and clear of its single vertical mast and lifting mechanisms, which are at the rear and out of the way. This leaves all sides of the server open, unobstructed, and available to the operator. Data center lifts must be stabilized for safety at all times while equipment is being lifted, removed from or installed into racks. Because lifts are on rolling wheels, if they aren’t well-secured, the lift will move when equipment is sliding on or off of the platform, creating serious danger for the operator and the equipment. To secure a Racklift, the operator must spend time strapping the device to the cabinet at four different points and applying the brake locks attached to the two rear wheels. The Racklift is dependent on the rack for support. The rack itself is often only secured to other racks in the aisle, and is filled with expensive servers. Without a rack, the Racklift and its equipment are in constant danger for rolling or tipping. This is why the Racklift is always shown being used with more than one person – one person is needed to stabilize it, and one to operate it. Without a rack, the Racklift and its equipment are in constant danger for rolling or tipping. This is why the Racklift is always shown being used with more than one person. With a ServerLIFT device, securing the lift requires the application of a single brake. The machine is locked down and rear wheels are lifted off of the floor. With this feature, the ServerLIFT device remains independently stable, and it will not move at all when heavy servers are slid on or off it, providing constant, steady, reliable support. The brake pedal is large, easy to engage, and fully accessible at all times at the back of the unit. Both RackLift and ServerLIFT devices provide horizontal shelf support into the rack, and RackLift even goes as far as providing an additional 14 inches of support. However, that extra shelf support length comes at the cost of extra device width, making it difficult to use in an aisle narrower than 60 inches (152 cm) and impossible to use in increasingly common 36-inch aisles. ServerLIFT’s built-in Easy Glide Shelf™ adds 6 inches of lateral movement to the left and right into the rack, allowing operators to walk around the unit and work comfortably even in aisles as narrow as 3 feet wide. 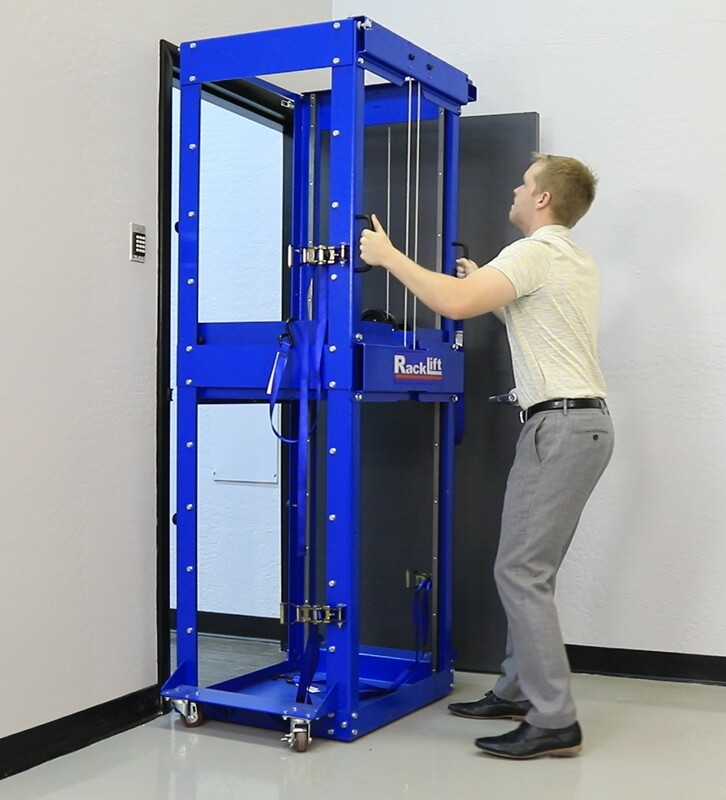 RackLIFT states that its RL600S hand-cranked lift has a greater weight capacity at 600 pounds (272 kg) than the 350 pounds (158.7 kg) capacity of the ServerLIFT SL-350X hand-cranked device. This does not tell the whole story. First, lifting servers with a weight over 300 pounds (let alone 600 pounds) by hand cranking requires a tremendous amount of arm and shoulder strength. It is difficult work, and the amount of both effort and force risks injury to the operator. That is why ServerLIFT rates all of its server-handling solutions appropriately. 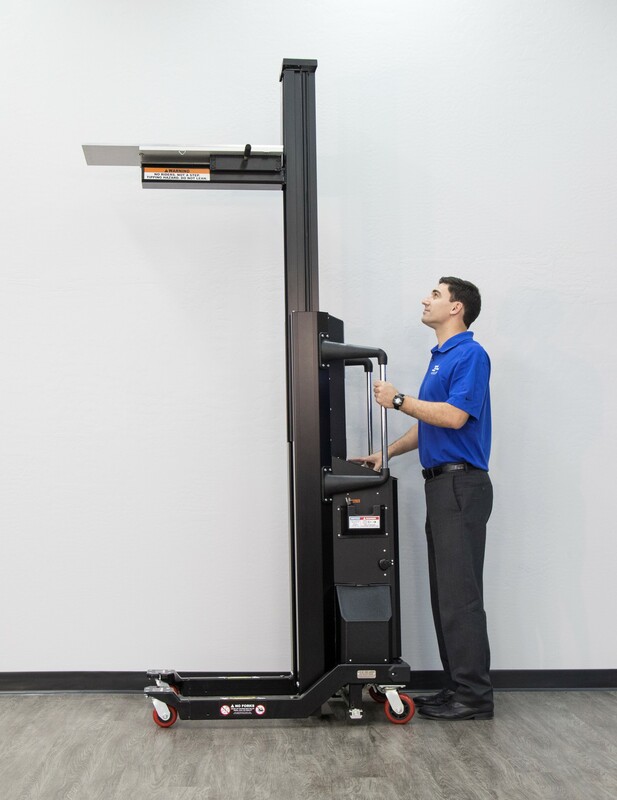 We offer data center lift options in 500-pound (226 kg) and 1,000-pound (454 kg) capacities with electric winches, not the arm and shoulder of a data center technician. The ServerLIFT SL-350X device that Racklift compares to its RL600S model was designed for a 350-pound weight limit because, as a manual hand-crank lift, it shouldn’t be used to lift greater weight. Manual hand cranking above the 350-lb. limit poses inappropriate levels of physical strain, even for occasional use. When choosing a data center lift, make sure that you choose a device that can handle 100% of the essential functions. 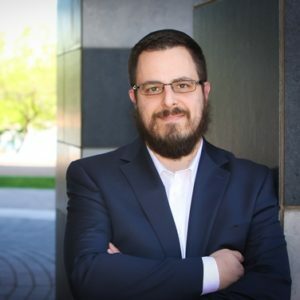 Beware of misleading or even false claims by manufacturers that call their devices “purpose built.” A purpose-built device means that it was designed to handle all of the functional aspects of day-to-day data center operations. It cannot fall short in safely completing all tasks, forcing operators to risk an accident or injury. To read more from ASU’s independent study, click here.